The pilot program, which runs through April 30, will expand to other high-traffic areas around campus if it’s a success. Beginning Monday, Feb. 16, FIU will debut a valet service at University Park designed to make it easier for campus visitors to park with maximum ease. Students, faculty and staff or visitors coming to campus to attend a class, meeting or event can pull up, drop their keys off and pay $5 per hour or $20 per day for the convenience of leaving their car with an attendant. The valet kiosk will be located next to Lot 3 by the Graham Center. Available Monday through Friday from 8 a.m. to 6 p.m., the service will be offered through April 30, according to Bill Foster, executive director of Parking and Transportation. At that time, the success of the program will be evaluated and a determination made whether or not to continue the program. Spaces will be available in Lot 3 and Lot 5 for use by the valet service. Good idea but for those of us in development, with donors coming to campus often for stewarship purposes, this should not be something for which they must pay. It should be part of our effort to thank them for their support. If money must be exchanged perhaps a small fund out of the foundation could be billed so that there is no requirement for donors to submit paperwork or anything else complicated. Bob, you are absolutely right. We have spoken with Parking about this and yes, departments will be able to purchase vouchers which can be given to University guests and donors. Contact them directly about purchasing. Hope that helps. This sounds like a great idea but i do think the price needs to be reduced. This isn't south beach twenty dollars a day is alittle much expecially if people have class 2 or 3 times during the week, ts $60 a week. I do not really like this plan; this means there will be even fewer preferrable parking spots available for us students. I'm assuming that the valet-only spots will be taking up the current student spots? However, if the valet were to take some of the metered spots that are currently in that lot, I would not really see an issue with this. I agree, it is a great idea but too expensive; I doubt it will succeed at that price. We are students–few of us work full time or have enough money left to spend after our necessities have been paid. And we are in a recession… I would rather pay for metered parking if I am in that much of a hurry to get to class or a meeting. This is a great idea for those who are in a rush to find parking before class or for those who just don't want to drive around for hours trying to find parking in this place; however, it does seem rather expensive. I'd rather park across the street and walk than pay $20 a day here and at least I know there are spots over there. The University should be worrying about making more spots instead of taking the ones we already have away for valet and making students and faculty pay more for the spot they previously would have had for free (well for what they already payed for them in tuition and faculty according to their pay). We need MORE spots. It's ridiculous when the University doesn't have enough spots available to their students and say it's a "privilege" to park. If this is a commuter school what do you expect, everyone to walk? I've seen so many people park in Tamiami park also, but now it is closed off. All those students now have to park behind the new stadium. What was needed more, a new stadium or parking? I'd say parking has become a huge problem at this University and we could use some more parking garages or something to ease the situation at hand. I also think that its a great idea.. but way to expensive! I like this idea for visitors especially. It would be great if this takes up the metered spots and not the students spots, and that the price decreases as well. Between carpool spaces taking away some of the students parking spots, soon we will be left with hardly any spots left, creating more traffic. Looking at the prices, I wonder how the university will use the profits that will be gain from this “little” business. Are we going to build a parking complex that is benefit the lack of feasible parking? Mind you, if you use the ground parking lot near the book store, the faculty’s and student’s, well mostly students, parking spaces will be limited. I don’t like the idea period. I already hate the system that we have now regarding: limited spaces, ridiculous parking fees, and violations policies that are pointless. I am surely not paying $20 a day or even $5 an hour. Go lay on an egg with that crap. I agree with the young lady or man that said that this school is not south beach. Amen, to that!!! How Miami… This isn't a nightclub. I'm a graduate student and I have attended many different institutions and this is rather ridiculous. This will not "create" anything… obviously. What will likely occur is that people will start getting awarded free valet parking service like the passes they were talking about. Then those people will begin having a vested interest in continuing the service whether it is "profitable" for the institution or not (bearing in mind that "profit" also needs to include the cost in time incurred to other offices in managing the service or even watching over a private contractor). How about starting up a bus or tram system like they have at UCF where everyone can get on and off as it passes their building… instead of using out current individual golf cart system where injured people have to wait on girls that want to flirt with the golf cart drivers. We could cooperate with the architecture department in designing lines and be a model for other institutions. If more of the student spaces are going to be taken for this valet service, then the "required" parking fee for each student should be changed to only the students who park in the lots, as more and more students will be taking the bus or carpooling. I don't think that students who are not able to park, as there aren't enough spaces, should have to pay around $70.00 a semester. That money is much better spent on school supplies, not the valet service. If none of the student spaces are going to be utilized for this new endeavor, then kudos to the parking department for thinking of the students for a change. If this is the case, then I fully support it. Maybe some of the proceeds can be used for another parking garage on the perimeter. $5 per hour is too expensive. Some places charge $3 per day. If a student is in a hurry for a class that lasts 3 hours…imagine paying $15. I would not make use of the serive…too expensive. This is absurd that he is impleting this at this rate. I was a student at FIU and had plans on opening a valet service for 5 dollars a day and would of offered a free red bull or water to students. This makes me sad to see such a great idea go to waste. This is a ridiculous plan. Does anyone really believe anything P&T does is to benefit students? Remember that as a student, you will have to pay for parking fees regardless of whether you actually have a car or not and no matter how bad the parking situation is. There's simply no incentive for them to provide students with better services or better parking spaces and that won't change until they stop forcing everyone to pay the same ridiculous fee and have to actually work for it. 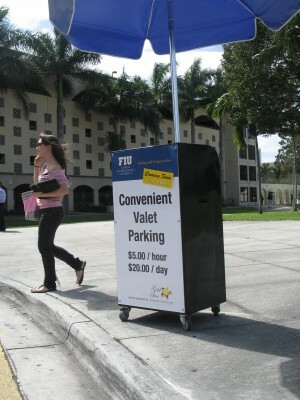 Many have said that the money they'll charge for valet parking is simply too much; well, not if you are in the board of trustee's or any other wealthy person visiting the university and specially not for someone that the university just wants to impress and pays for their voucher (which will be many.) This is clearly not designed with the majority of the university community in mind, it's just a way to bring a new level of service to those that the university management deem worthy. The spots in Lot 3 have taken over 5 Faculty/Staff Parking spaces. As a staff member that pays on a yearly basis for a decal, I find this appalling. The spots should have replaced 5 metered spaces since it is a revenue generating venture and I don't foresee our F/S decals decreasing in price anytime soon. Ok, so this basically means that on top of paying for tuition and books and a parking decal now we also have the pleasure of paying for valet parking. Thats great! The whiz behind this idea probably figured that students will have an even harder time finding parking now (since most spots will be designated for valet services) and thus wanting to avoid being late to class will fork over $10 to avoid the endless search for parking. And it will be a minimum of $10 because classes alone are over an hour long and you still need to walk to class maybe chat with the professor after and then walk back, definitely totals to over an hour. And who has been hired to valet our cars? I rather not have a work-study drive around in my car unsupervised and maybe stop and pick up some friends while their at it – no thanks! And if FIU hired a professional service, how exactly does this fit into the hotly debated budget? As far as vouchers go, if a prospective sponsor is considering donating money to our school then what better way to start than by paying for their own parking? It's like saying "Welcome to FIU, no we cannot pay for your parking because our school is in a critical situation and we surely could use all the financial support we could get…let us show you around so you can see what other areas need improvement." If they are donating thousands of dollars whats another $3 gonna hurt? Instead of wasting my time and money thinking about valet services they should be wondering how to address the current shortage of parking for students. parking is absolutely horrendous. i can't tell you how many times i've circled the entire campus at 5:30pm just waiting for anything to open up. the p&t dept is a complete mockery. its absurd that parking is considered a privileged. if it *is* a privilege, then my parking fees shouldn't be mandatory. Don't like the idea because this takes parking spots away from student's who don't have the money to pay for this. Another waste of space just like the carpool parking spots which are always empty. Who carpool's in miami please, everyone has a car. and I agree with the person that mentioned above that this isn't south beach, $20, c'mon? How about building a new parking garage or making more spots for us? Instead, they take them away! I'd like to know where the profit of this little "pilot program" is going to be dispursed…. in the pockets of people who don't even need more money! Budget cuts huh? Yeah right… raise our tuition and fees and THEN give us less for our money. I hope people do NOT use this system!! At the end, the pilot should be proved not necessary. There is going to be a parking garage built next to Red, across from the new nursing building that is being built. Also, I think instead of posting these ideas, you should actually tell someone like the student government, who I believe makes the charges for the parking decals. I've asked before the parking office why we have to pay the fee for the decal, if we don't even have a vehicle, and they said to speak to the student association,which I believe it to be the student government..
Hope this helps! Make a difference. I think this is a horrible idea because as most have already expressed, there is NO PARKING at FIU unless you get there from 8 AM or after 6PM. But hey I guess P&T thinks 20 bucks a day is cheaper than the ticket for parking in a faculty spot right? What other university in the nation does this, I've asked many colleagues and they think it's absolutely absurd. Is this an academic institution or a club on South beach?? Students automatically pay for parking each semester, what are they doing with this money?? There is already a parking problem on this campus, how dare them try to exploit students, who have already paid for this service!!! Who even approved such a venture?? This is a joke!!! As for on campus visitors, why not do what every other school does, metered parking!! Just another ridiculous way of exploiting the students!!! I feel especially sorry for the International students who pay almost $8000. a semester!!! Glad to see that the valet parking spaces were relocated to the meter parking lot area. Faculty & Staff now have their 5 spaces back. I think this is a horrible idea. Please show us some numbers of this pilot program. I foresee a very steady decline in the cash flow of the business. Just paying 1 or 2 people to work here compared to how much it costs to park versus the chances of people parking make this worthless. I think our resources would be better suited towards a better solution, such as a parking lot. This is totally ridiculous! What a waste of time thinking about offering this expensive service when parking fees aren't optional. I truly hope it doesn't succeed. Why take more spaces away from the students.. as if we didn't drive around enough to find a darn spot. The meeting held for this idea, should have been time spent on implementing ideas or raising money to build another garage.. maybe across the book store.. and with at least more than 5 floors! I wonder… where my tuition money is going. Hmm.